In her vivacious, yet reality-check manner, Shannon Forsell opened up her soul and life to the audience this weekend with her performance, Shannon Forsell: Songs I’ve Never Sung on Broadway. With its crystal chandeliers, breathtaking views overlooking the lighted monument and luxurious surroundings, The Cabaret at The Columbia Club, Indianapolis’ poshest nightspot for all things cabaret, was the perfect place for Circle City’s darling to enlighten all of the details surrounding her trials, triumphs and … tiaras. A former Miss Indianapolis and first runner up to Miss Indiana, the vivacious and captivating songbird once was also adorned with banners and crowns. 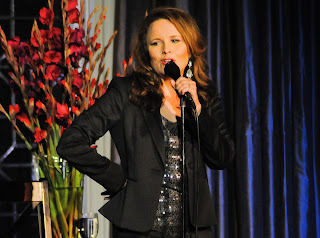 Admitting she blew her chances during the interview section, Forsell segways into songs describing how she turned away from the bright lights of Broadway, returned to her roots, and tuned into a different musical genre: Cabaret. Whether gracefully lounging across a polished piano, sassing up a self-deprecating joke or sharing a tender thought about husband, David Forsell, the chanteuse lights up the stage and heart. Broadway's loss is Indianapolis' gain as Forsell shares her stories, delicious sense of humour and vocal talent with a song list that includes, Maybe This Time (Cabaret), Dreamed a Dream (Evita), I Forgot to have Children, As if we Never Said Goodbye (Sunset Boulevard), wrapping with I Told Ya I Love Ya, Now Get Out. Due to the sold out status of both performances, and the number of people who had to be turned away, an encore performance is slated for Sept. 7. Bottom Line: When a star shines as brilliantly in the velvet indigo sky over Indianapolis as Shannon Forsell, she will prove, undeniably, to be the guiding light beckoning the world's attention to the city's Cabaret scene. Elizabeth J. Musgrave is a syndicated columnist, travel writer, performing arts and restaurant critic. Catch her as Indy’s Entertainment Adviser on 93 WIBC, and follow her on Twitter @GottaGo and Facebook. Gotta Go is published on BroadwayWorld.com and in M magazine and the following newspapers: South Sider Voice, Indiana Weekender, New Palestine Reporter, Pendleton Times Reporter and Fortville-McCordsville Reporter. Artists from seven different counties but who create art in studios at the Stutz building will participate in the 19th annual Raymond James Stutz Artists Open House April 27 and 28. 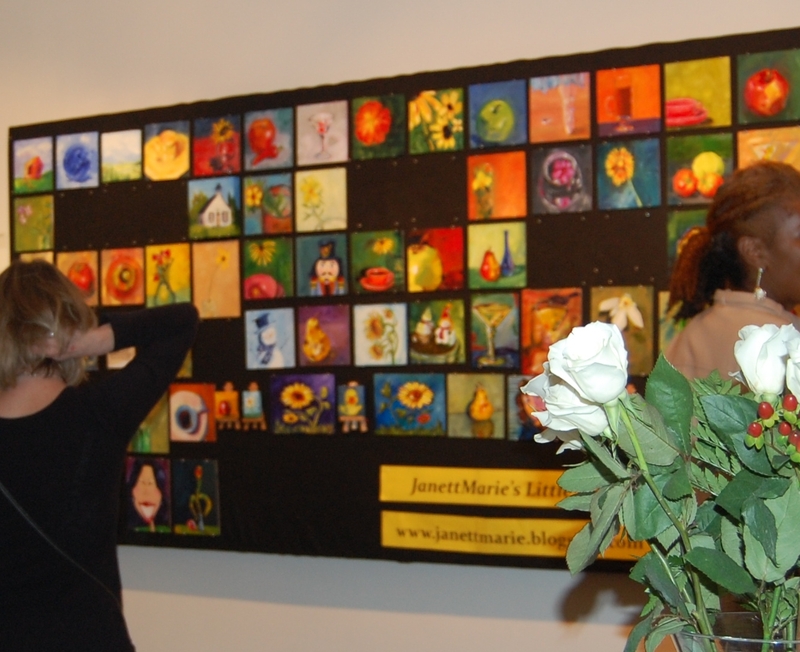 More than 70 artists will open their studios to visitors during the two-day event. 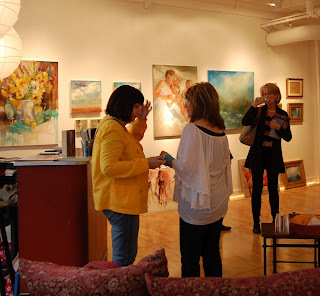 The open house is an opportunity to see artwork in the settings where it's created. Artwork ranges from paintings, drawings and photography, to sculpture, jewelry and furniture. The event also offers a rare chance to see vintage cars on display in the historic Stutz car factory. WHEN: Fri., April 27, 5:30-10:30 p.m.; Sat., April 28, 2-7 p.m. COST: $10 advanced sale tickets at select Old National Bank centers or the Stutz Business Office; $12 at the gate; $8 Saturday re-entry (with Fridays ticket stub); Admission for children is the same as admission for adults on Friday night; children 12 and under free on Saturday. Elizabeth J. Musgrave is a syndicated columnist of Gotta Go, travel writer, performing arts and restaurant critic. Catch her as Indy’s Entertainment Adviser on 93 WIBC, as weekly columnist of Infused at FoodandDrinkDigital.com and follow her on Twitter @GottaGo and Facebook. Gotta Go is published on BroadwayWorld.com and in M magazine and the following newspapers: South Sider Voice, Indiana Weekender, New Palestine Reporter, Pendleton Times Reporter and Fortville-McCordsville Reporter. Some shows are best enjoyed on the silver screen, like Titanic 3D or Armageddon, while others are able to go from stage to screen and back again with the smoothness of a charming con man. The Music Man is just such a show. Opening at Beef and Boards Dinner Theatre, Indianapolis, the six-time Tony Award winning musical (book, lyrics and music by Meredith Willson) brings a smooth-talking salesman into an Iowa city in 1912. River City, to be exact, which brings us immediately to one of the many fun musical numbers, Trouble. The song is performed expertly, and at rapid speed, by Curt Dale Clark (White Christmas, Annie Get Your Gun) as Professor Harold Hill, the consummate con artist and the townspeople. Clark delivers Hill with such complete devilish charm as to give Robert Preston's 1962 film version a run for his money. With devil-may-care good looks and obvious merriment at being such a scoundrel, Clark is pure joy to watch ... while conning the entire town out of their money. 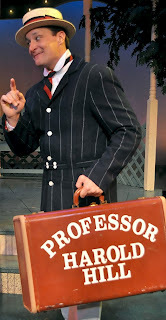 During our interview, Clark describes what makes playing the character of Professor Hill at Beef and Boards, as well as Fulton Theatre, et al, so enjoyable. "I love playing Harold because he is so well constructed. In the beginning he is really not a nice man, but throughout the course of the play he is changed by his co-star Marion into a much better person and the audience loves to take that journey with him and it makes it very fun!! Hill's love interest, and town librarian, Marian Paroo is portrayed charmingly by Katie Sina. Pairing nicely with Clark, Sina captivates the audience with her rendition of My White Knight. Special mention goes to the break-into-song-at-the-drop-of-a-hat quartet consisting of John Vessels, Rex Wolfsley, Kenny Shepard and Damian Norfleet. Watching the group of school board members turn into the singing foursome, "Good Night Ladies," Pavlovian-style upon Hill's command is an absolute riot and must-see. Bottom Line: Beef and Boards' The Music Man may have trouble in River City, but it brings nothing but fast-paced hilarity to Indianapolis. Elizabeth J. Musgrave is a syndicated columnist, performing arts and restaurant critic, and travel writer. Catch her as Indy’s Entertainment Adviser on 93 WIBC, and follow her on Twitter @GottaGo, LinkedIn and Facebook. Gotta Go is published on BroadwayWorld.com, AroundIndy.com, in M magazine and the following newspapers: Southsider Voice, Indiana Weekender, New Palestine Reporter, Pendleton Times Reporter and Fortville-McCordsville Reporter. Email her at elizabeth@gottago.us. 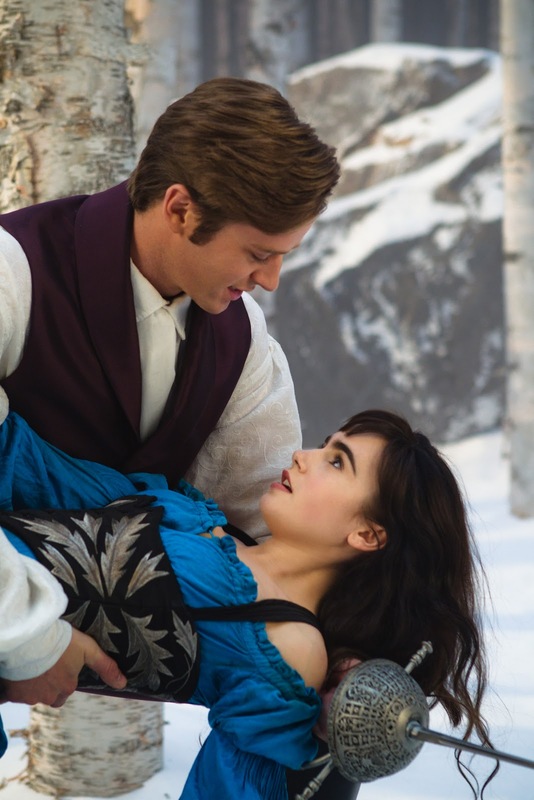 The tale of Snow White (Lily Collins) and her evil stepmother is well known, with numerous versions of the good vs evil story throughout movie history. 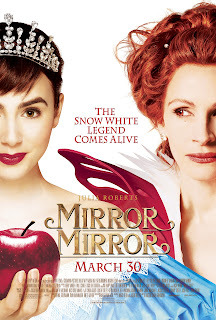 Mirror Mirror takes the viewpoint from the narcissistic Queen (Julia Roberts) who slips through the mirror to talk with an alter ego for reassurance she is still the most beautiful in the land. This movie is one of those you walk out of the theater thinking, "It coulda, shoulda, woulda been so much better if..."
Not that it was bad, mind you, it just didn't quite reach its potential. Neither funny nor scary enough to make you think, "I have to see this again," or "OMG, I cannot believe how fabulously funny/scary it was." It is, as so many films do nowadays, trying to be all things in all categories and that method so rarely works it could be considered an urban legend. Many ideas of how it could have been tweaked to bring it up that extra notch cannot help but flutter through your brain while discussing it afterward with fellow film friends. The utmost topic after Mirror Mirror for me was if Roberts was truly the best choice for the villainous Queen. What makes the Pretty Woman star so irresistible, and a fan favorite again and again, is actually what plays against her in this almost fabulous flick. Her twinkling eyes full of mirth and joy which cannot be restrained. Pure, unadulterated, heinous, reprehensible, cold-hearted, contemptible evil in its purest form. Only one name (within the correct age range) could be conjured as pulling off this role with the necessary skill, the talent of one so evil they could kill a young virginal, naive, sweet innocent. Only one. No one else could flick a wrist and create death, throw a glance to destroy an entire kingdom or sneer in such a way to create fear in all who come into contact with her, while simultaneously flirting with a prince, worrying about wrinkles and checking her beautiful costumes in the mirror. The other roles were portrayed fine, but also restrained in their performance, with the exception of the seven dwarfs who were allowed to go all out. Nathan Lane has so much comedic talent and, yet, it seemed as if he was instructed to not go over-the-top. A mistake as he could have brought the fun factor up several notches. Bottom Line: Mirror Mirror is a lighthearted film suitable for families, girls night and kid-friendly evenings. Elizabeth J. Musgrave is a syndicated columnist, travel writer, performing arts and restaurant critic. Catch her as Indy’s Entertainment Adviser on 93 WIBC, and follow her on Twitter @GottaGo and Facebook. Gotta Go is published on www.BroadwayWorld.com and in M magazine and the following newspapers: South Sider Voice, Indiana Weekender, New Palestine Reporter, Pendleton Times Reporter and Fortville-McCordsville Reporter. Mike Wallace, CBS news correspondent, host of television's hard-hitting program 60 Minutes and World War II Naval veteran has passed away at the age of 93. 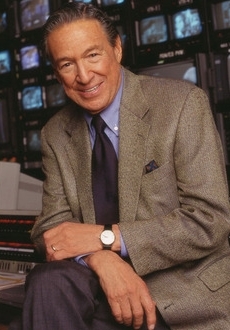 Wallace's career included interviewing celebrities, politicians and sports figures with a controversial style which spanned 60 years in radio and television. For details on Mike Wallace, click here IMBD.com/MikeWallace. "Painter of Light" artist Thomas Kinkade has passed away Friday, April 7, at home in Los Gatos, Calif. The popular artist was 54 at the time of his death attributed to natural causes. He is survived by wife, Nanette, and daughters, Merritt, Chandler, Winsor and Everett. 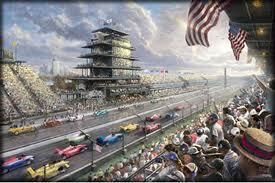 Known for his warm, inviting cottage, church and landscape paintings, Kinkade also created the 2009 program cover for the Indianapolis 500's 100th anniversary celebration. Click here for post. About the honor of painting the artwork for the celebratory event's program, Kinkade told me at the gala he had inserted the figures of well known individuals, including artist Norman Rockwell, in the stands for fun. The artist became one of the most successful commercial artists, often criticized as being too commercial, creating the gallery retail franchise which sold his works in malls throughout the world. For more information about Kinkade's works, visit ThomasKinkade.com. Elizabeth J. Musgrave is a syndicated columnist, travel writer, performing arts and restaurant critic. Catch her as Indy’s Entertainment Adv on 93 WIBC, and follow her on Twitter @GottaGo and Facebook. Gotta Go is published on www.BroadwayWorld.com and in M magazine and the following newspapers: South Sider Voice, Indiana Weekender, New Palestine Reporter, Pendleton Times Reporter and Fortville-McCordsville Reporter. An alternative to normal holiday fare, Old Blue Eyes: Frank Sinatra and the Rat Pack, includes new pieces from choreographers Cynthia Pratt and David Hochoy, and runs two weekends. The final concert of the season is pure contemporary dance featuring new works from Chicago choreographer Brock Clawson and DK’s Artistic Director David Hochoy. Rounding out the program will be Hochoy’s Electric Counterpoint and iconoGlass. Tickets: Call 317-940-6555 or email janies@dancekal.org. To apply for the Tuesday, November 13 ticket give away, post your name and email address in comments section below. I will draw randomly from names at 9 p.m. Monday, November 12. Billy Elliot: The Musical is the joyous celebration of one boy's journey to make his dreams come true. Set in a small town, the story follows Billy as he stumbles out of the boxing ring and into a ballet class, discovering a surprising passion that inspires his family and his whole community. 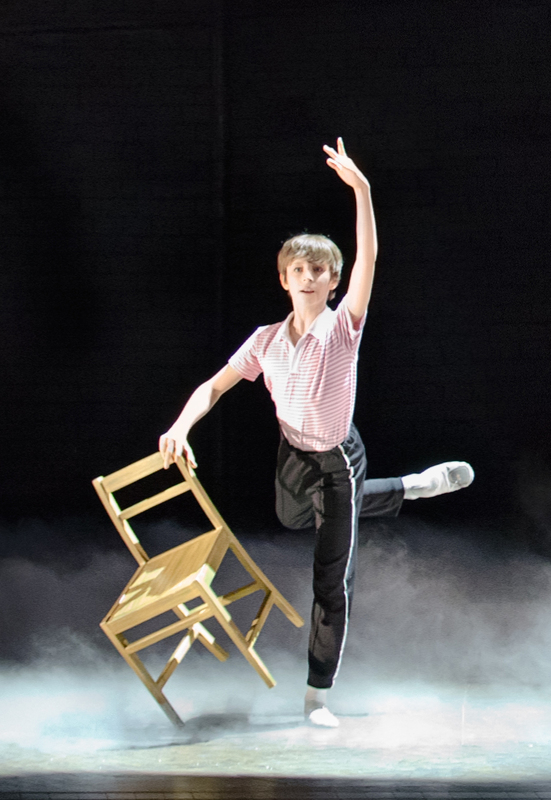 A big musical with an even bigger heart, Billy Elliot will enchant the dreamer in all of us. 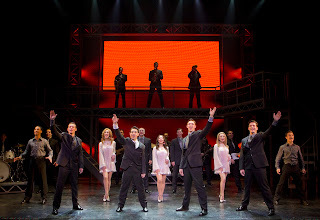 JERSEY BOYS, is the Tony®, Grammy® and Olivier Award-winning Best Musical about Rock and Roll Hall of Famers The Four Seasons: Frankie Valli, Bob Gaudio, Tommy DeVito and Nick Massi. 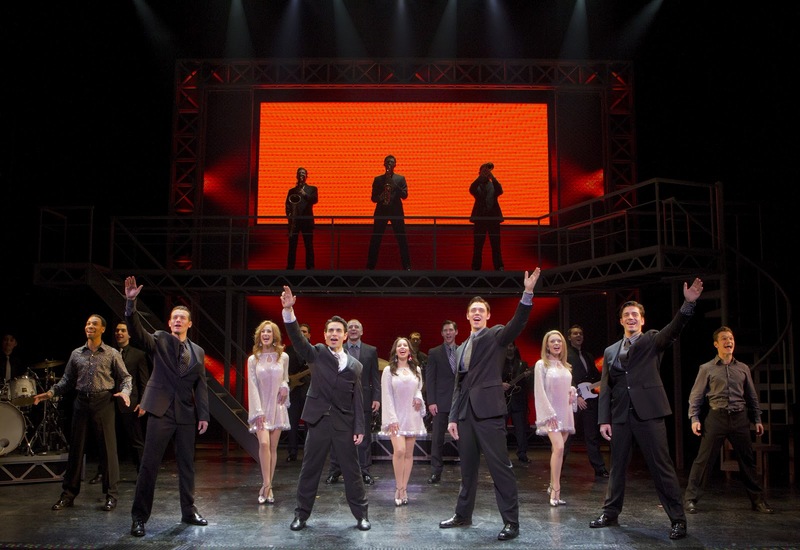 For a review of Jersey Boys Indianapolis performance, 2010, click here. This is the story of how four blue-collar kids became one of the greatest successes in pop music history. They wrote their own songs, invented their own sounds and sold 175 million records worldwide - all before they were 30! JERSEY BOYS features their hit songs "Sherry," "Big Girls Don't Cry," "Rag Doll," "Oh What a Night" and "Can't Take My Eyes Off You." 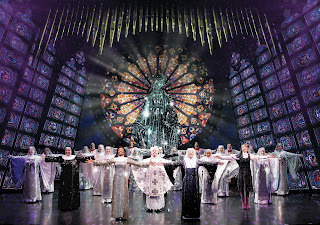 Featuring original music by 8-time Oscar® winner ALAN MENKEN (Beauty and the Beast, The Little Mermaid, Little Shop of Horrors), SISTER ACT tells the story of Deloris Van Cartier, a wannabe diva whose life takes a surprising turn when she witnesses a crime and the cops hide her in the last place anyone would think to look: A convent! Under the suspicious watch of Mother Superior, Deloris helps her fellow sisters find their voices as she unexpectedly rediscovers her own. 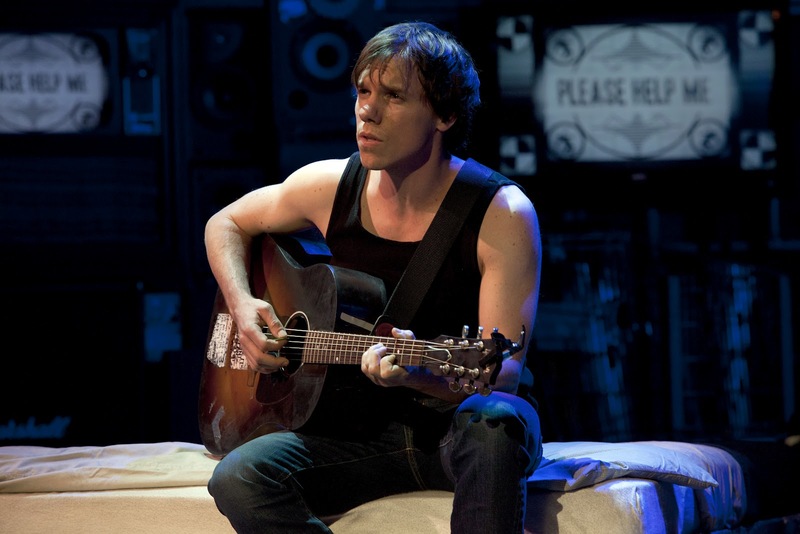 Direct from Broadway, the smash-hit musical AMERICAN IDIOT tells the story of three lifelong friends, forced to choose between their dreams and the safety of suburbia. Their quest for true meaning in a post 9/11 world leads them on the most exhilarating theatrical journey of the season. Featuring the hits "Boulevard of Broken Dreams," "21 Guns," "Wake Me Up When September Ends," "Holiday" and the blockbuster title track, AMERICAN IDIOT. More than 50 years ago one musical changed theater forever. Now it's back, and mesmerizing audiences once again. From the first note to the final breath, WEST SIDE STORY soars as the greatest love story of all time and remains as powerful, poignant and timely as ever. 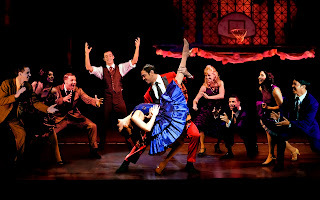 The new Broadway cast album of WEST SIDE STORY won the 2010 Grammy Award for Best Musical Show Album. Bernstein and Sondheim's score features such classics as "Something's Coming," "Tonight," "America," "I Feel Pretty" and "Somewhere." 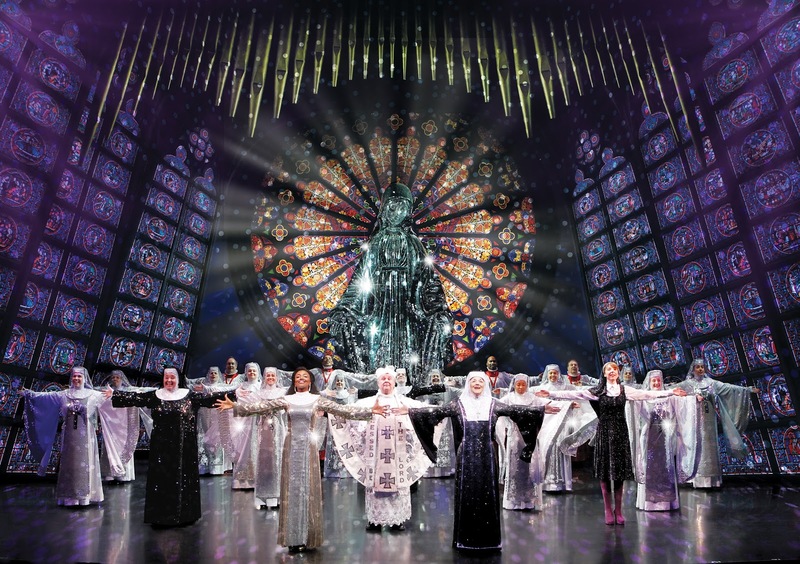 Five-show season ticket package range between $120 and $471 depending on seat location. Elizabeth J. Musgrave is a syndicated columnist, travel writer, performing arts and restaurant critic. Catch her as Indy’s Entertainment Adviser on 93 WIBC, and follow her on Twitter @GottaGo, LinkedIn and Facebook. Gotta Go is published on BroadwayWorld.com, AroundIndy.com. in M magazine and the following newspapers: South Sider Voice, Indiana Weekender, New Palestine Reporter, Pendleton Times Reporter and Fortville-McCordsville Reporter. Simple can be so much more when done well. And, when you do something well, it doesn't require flash or smoke and mirrors. Particularly with food, it seems as if so many feel a need to keep adding. 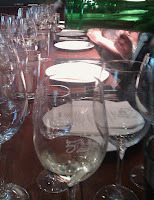 Seasons 52, Indianapolis, invited me to preview the unveiling of its spring menu. So I did. Known for its simplistic approach to food done well, S52 is a Darden restaurant that opened in Indy last year. (Read review here) This go-round, the menu is inspired by items available in early spring, such as artichokes, asparagus and snow peas. 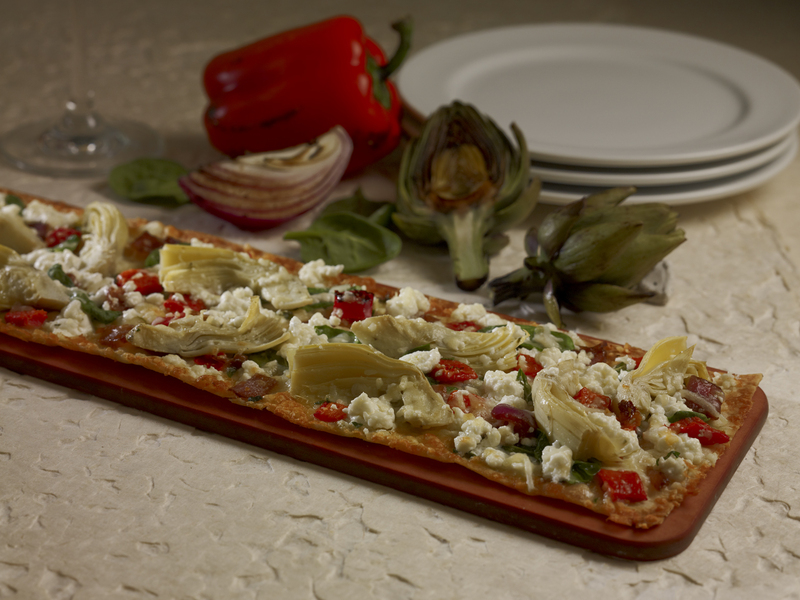 Utilizing fresh ingredients (local as available) keeps the menu changing seasonally. 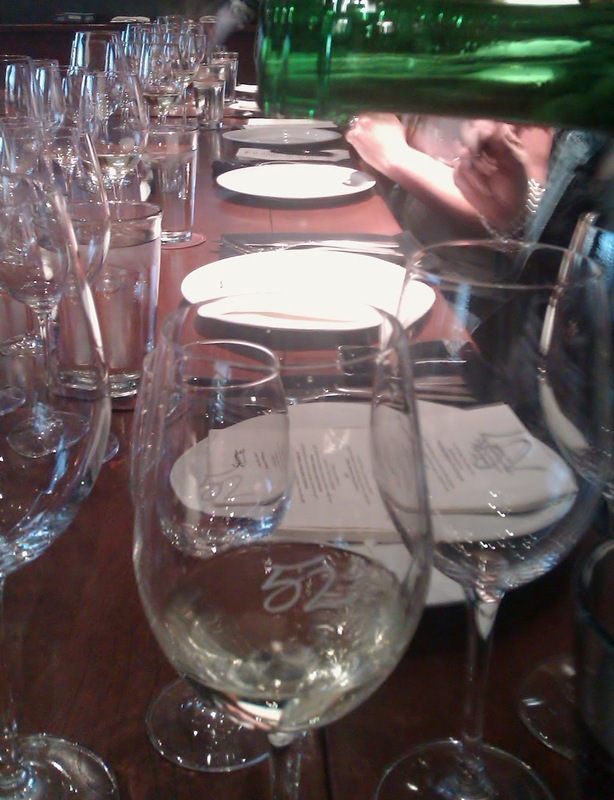 The spring menu was created by Chef Clifford Pleau. His career's history, including personal chef to opera legend Luciano Pavarotti, is heavy with awards earned, such as "Menu Masters Chef Innovator of the Year” – Nations Restaurant News (2007). In-house executive chef and partner is Chef Bill Erath who was lured away from Weber Grill in downtown Indy. His wealth of knowledge and willingness to share with a sense of humor made the evening even more enjoyable. Cocktail: Zardetto Prosecco (Treviso NV) and strawberry Kir Royal cocktail-This is a great way to enjoy the now-trending Champagne cocktails. The strawberry garnish enhanced the blended flavors which were refreshing, crisp and light. Wine: With a different wine for each food item, it would be difficult to zero in on one wine as better than the rest as each paired perfectly with its course. I generally go with what resonates with me several days or weeks later. Standing out most, however, after this amount of time are the Botani Moscatel (Sierras de Malaga '10) with the trout and the Selbach-Oster Bernkasteler Badstube Riesling (Auslese, Mosel '06/'10) with desserts. Wine director: Master Sommelier Georges Miliotes (#152). Appetizer: Artichoke and goat cheese flatbread-This appetizer is becoming quite common now, but the restaurant takes it up a notch or two with the combination of artichokes, goat cheese, roasted peppers and leaf spinach. Entree: Out of all items tasted, I would say that if you care for lamb (as I do) then the tender T-bone lamb chops are an absolute must. 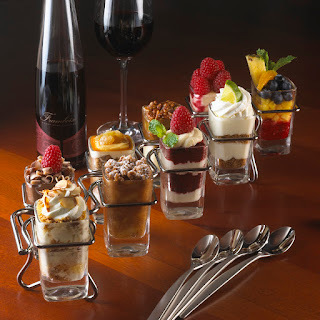 Bottom Line: Seasons 52, the "Chef-driven" restaurant which has created a new level for other chains to strive for, has continued its high standards of epicurean delight with its spring menu. For hours of operation, reservations, directions and the full spring menu, visit Seasons52.com. Elizabeth J. Musgrave is a syndicated columnist, travel writer, performing arts and restaurant critic. Catch her as Indy’s Entertainment Adviser on 93 WIBC, and follow her on Twitter @GottaGo and Facebook. Gotta Go is published on BroadwayWorld.com, in M magazine and the following newspapers: South Sider Voice, Indiana Weekender, New Palestine Reporter, Pendleton Times Reporter and Fortville-McCordsville Reporter.